Seasoned skiers are always on the lookout for new and exciting slopes around the world. They could do a lot worse than Asia, as the continent has some of the best slopes in the world. We’ve taken a look at some of the crème de la crème of skiing destinations for your next trip. We selected two of the best resorts in each country: Japan, South Korea and China. These resorts are guaranteed to provide the ultimate skiing thrills and a chance to fine tune your skills while you’re at it. Appi Kogen is spread out over a huge 282 hectares, and offers 21 ski trails, each offering a run of two kilometres on average, which is the longest average in the country. Skiers who prefer a bit of space will love these slopes, as even throughout the high season they can be relatively empty. You can expect to find fresh, dry powder all year around, and the slopes of Mount Nishi Mori are steep enough to provide even the most advanced skiers with a challenge. When you’re done with the slopes, you can take advantage of some of the off-piste activities, such as onsens (Japan’s famous hotsprings), sledding and snowmobile courses. There’s also a dairy farm with excellent cheese and ice cream on offer. To get to Appi, you should head to Tokyo and then jump on the JR East Shinkansen line to Morioka. From there you’ll take the Hanawa train line to Appi Kogen, then the free shuttle bus to the resort. 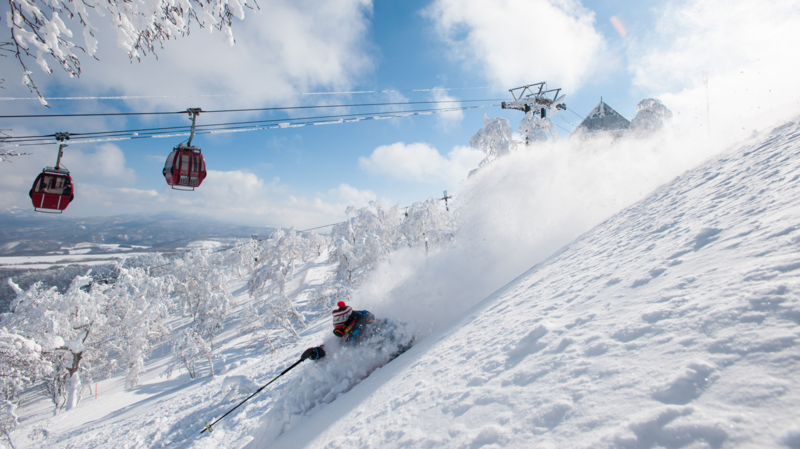 Niseko has four separate ski resorts, with Niseko Hirafu being the largest one. The terrain totals 2,191 acres and a single ski pass will grant you access to each of the resorts. Niseko is one of the snowiest resorts on the planet, thanks to Siberia’s winter storms. It appeals to advanced skiers because of the off piste and night skiing options. Regulars will tell you that it’s possible to ski into chest-high powder with almost no resistance! After a hard day (or night) of skiing, you can head into the bars to party the night away with the many revelers that frequent the slopes. Australians love Niseko for its off-piste partying! You won’t find nightlife quite like this on any other Japanese resort. There are also a couple of fun parks in the town below; soak in a relaxing onsen, get a great massage, or take a snowmobile course if you fancy. You can reach Niseko via JR trains, whether you’re coming in from Sapporo, Otaru, Hakodate or New Chitose Airport. Buses are also an option from Sapporo and New Chitose Airport, or you could consider renting a car, as many skiers do. Alshan Ski resort, close to the border of Mongolia, is blessed with endless snowfall; the slopes are always laden with fresh powder, so it’s a skier’s paradise. Coupled with awesome mountain landscapes, it’s a very refreshing place to ski. Spread over 6000 square metres, Alshan can hold 4000 skiers at any given time. Alshan is used as a training ground for the Chinese national ski team as well as the Olympic ski team, which will be music to the ears of advanced skiers. You will want to head over to the West Hill terrain, which is designed for ski racing. Here you’ll find 5.5 square kilometres of slope to ski, with several alpine and cross-country trails. To get there, head to Beijing and jump on an internal flight to Ulanhot. From this airport you can take either a train or bus to the resort. Yabuli Ski Resort is the biggest in China, with around 30 km of slopes to ski. Opened to the public back in 2010, it remains the resort of choice for Chinese Olympic team training; advanced skiers can make the most of the challenging but exhilarating runs here too. To get to Yabuli, you’ll need to head to Beijing. From there you can fly onward to Harbin or Mudanjiang. Either city offers shuttle buses or trains that will take you to the resort. Otherwise, there’s a direct overnight train from Beijing to Yabuli. Yongpyong Ski Resort is South Korea’s oldest resort. It is an incredibly popular resort, and one frequently selected to host international tournaments; the Asian Winter Olympics of 1999 were held here. The resort has 31 slopes spread out over 1,620 hectares. This equates to around 25 kilometres of skiing potential, including a 6 km journey down the Rainbow Paradise run that advanced skiers will enjoy. To get there, head to Seoul and hire a car. You will arrive at Yongpying in around two and a half hours. If you don’t want to drive, jump on one of the daily shuttle buses to the resort from Seoul or Hwenggye. These Asian ski resorts promise to leave a lasting impression on even the most dedicated of skiers. The chances are that your skiing experience will be unique and novel, so don’t be surprised if these world-class resorts set a precedent! Alpensia was the home of the 2018 Winter Olympics, which should give you an idea of its quality; from 2009, the Koreans put in a lot of hard work to build a resort that was up to Olympic hosting standards, and Alpensia is the result. Spread over 4.9 square kilometres of terrain and situated near to the Odaesan National Park and the Samyang Ranch, Alpensia has much to offer advanced skiers. There is a sports park with two jump slopes of international standard, and cross country and biathlon ranges. Head to the top of the 160-metre high ski jump tower for breathtaking views of Daegwallyeong. You can get to this via the monorail. The easiest way to get to Alpensia is to hire a car and drive from Incheon International Airport, which will take you around three and a half hours. Thanks for your advice Jimmy! I’m also looking for places that are more for advanced skiiers but there hasnt been much useful information online. Just wondering if you have any advice for europe and other asian countries? Thanks!